Sign up for Healing Times eNewsletter and get 2 Free Gifts! We deeply respect your privacy, we guarantee that your email will not be rented, sold, or spammed! Healing Times is not just articles and poetry, about once each week you will be treated to free audios and videos as well. You will stay abreast of the latest in Mind-Body Medicine, new Mind Tools you can use for yourself or your patients and clients, and feedback from the front lines of the current global transformation. There will always be something for the funnybone, Dr. Miller’s latest articles and podcasts, new product releases, special offers, and personal insights from Dr. Miller. This will be a two-way conversation, you will have plenty of opportunities to respond and join in the conversation. It also brings you information on upcoming events featuring Dr. Miller, previews of this months guests on “Conversations With Extraordinary People,” his internet radio show, free meditations and guided imagery, and more! Come, join this remarkable online community of people interested in deep healing, peak performance, collective wisdom, and planetary sustainability. What’s more, you will be the first to learn about new audio and video products, movies, and receive exclusive discounts on new releases and bestsellers. Visit our Healing Times eNewsletter Archives to read sample of past issues! Your first gift is the newest of the six books he has written; it represents perhaps his greatest contribution to the transformation, the paradigm shift, that so many of us are working toward and that must occur if we want to be in charge of setting our communal direction into the future – something that must occur if we are to create sustainability, or to even survive. Dr. Miller’s life and work have been an ongoing process of awakening to certain eternal truths about life and humanity and applying them for personal healing and transformational change in relationships, teams, and communities. Our Culture on the Couch presents the results of these findings and shows us why we need to begin to wake up to the fact that we must go beyond the limitations of the past and create a sustainable, just, and peaceful future. In Our Culture on the Couch, Dr. Miller reveals the result of the careful examination he performed on our world and the people in it, and shares the single systemic diagnosis he has found for the many serious ailments that currently threaten our civilization. But, surprisingly, the prognosis is not necessarily dire. Despite the litany of problems we face – personal fear, illness and depression; violence; political and corporate corruption; terrorism; environmental devastation – Miller finds underlying causes that he believes can be successfully treated and reveals the treatment he recommends. This soothing experience of guided imagery is part 1 of the CD/mp3 download Relaxation and Inspiration. It is a good basic introduction to Mind-Tools, and is self-explanatory. Simple, comforting, and invigorating – a good all around meditation and stress management tool, as well as a way to kindle some fire in your belly. 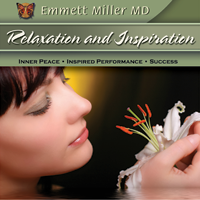 After relaxing into a deep meditation, you are guided by Dr. Miller to deeper, inspirational levels of your being. Your meditative experience continues over beautiful classical music, featuring the exquisite flute of Bettine Clemen, and other fine musicians. As you learn to apply this Software for your Mind, you more fully sense your deeper Self – what some might refer to as your “spirit,” or “soul,” and be inspired by it. Then you will be invited to bring this awareness and wisdom back to your everyday life, bringing with you your connection with this extraordinary inner source of power and Love. tools for Deep Healing and Peak Performance.